Kim's infertility struggle brought her to my little corner of the interwebz and she decided to order a baby quilt for her cousin. 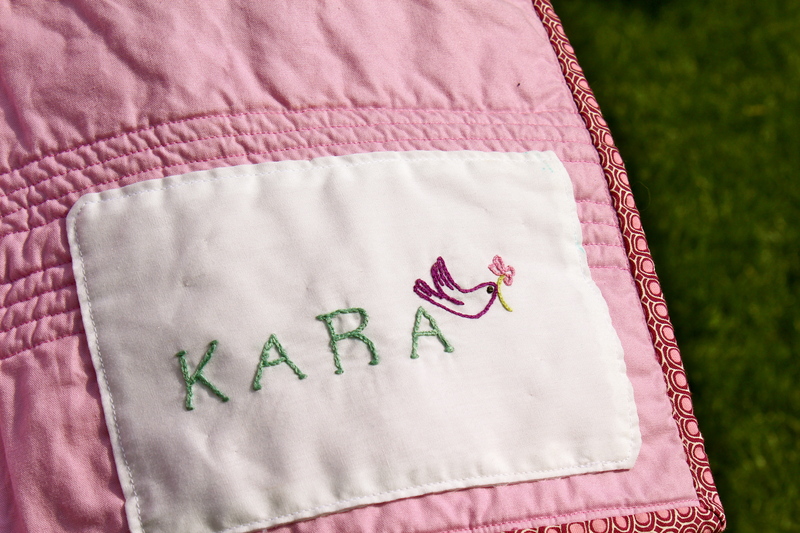 She wanted something in shades of purple with the baby's name added somewhere on the quilt. Not being a huge purple fan myself, I was worried I would have trouble finding fabric we both liked - and then I stumbled upon the Aviary 2 collection in lilac and kinda fell in love. 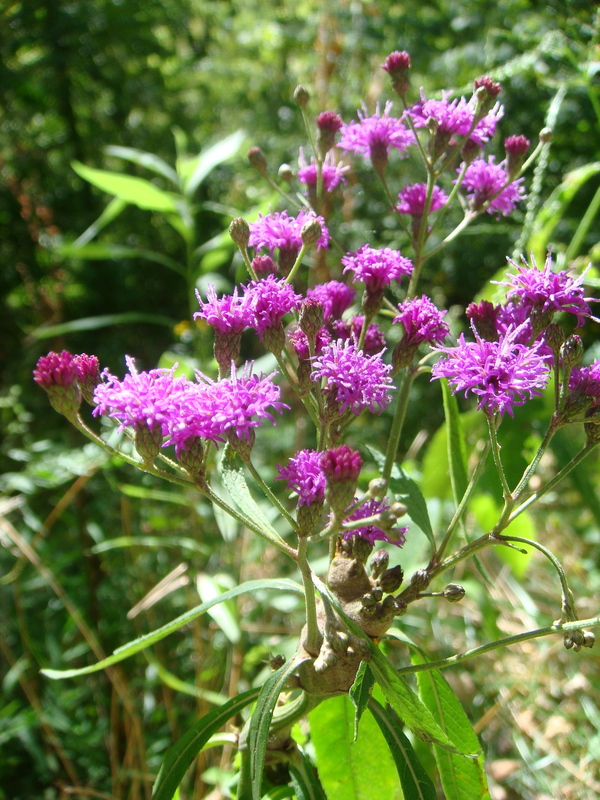 With purple fabric. Who knew? And Kim loved it too. 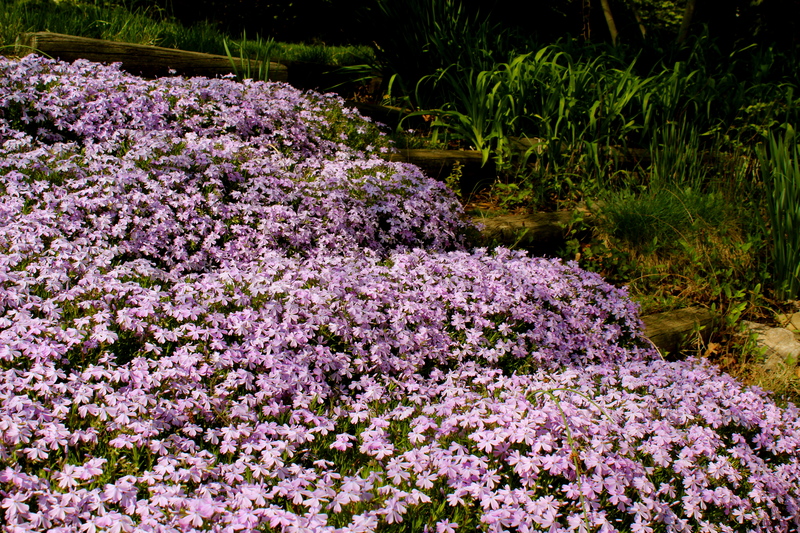 The purples are deep and and complex and paired with spring greens and sky blues. 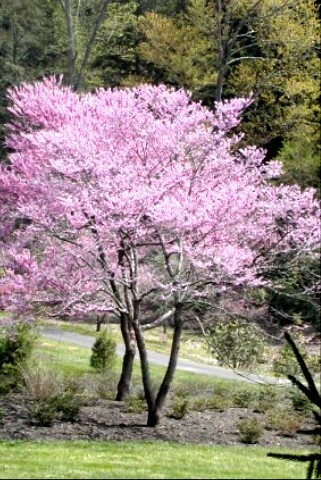 After I ordered it I kept seeing the same color palate in the early spring foliage everywhere I went. 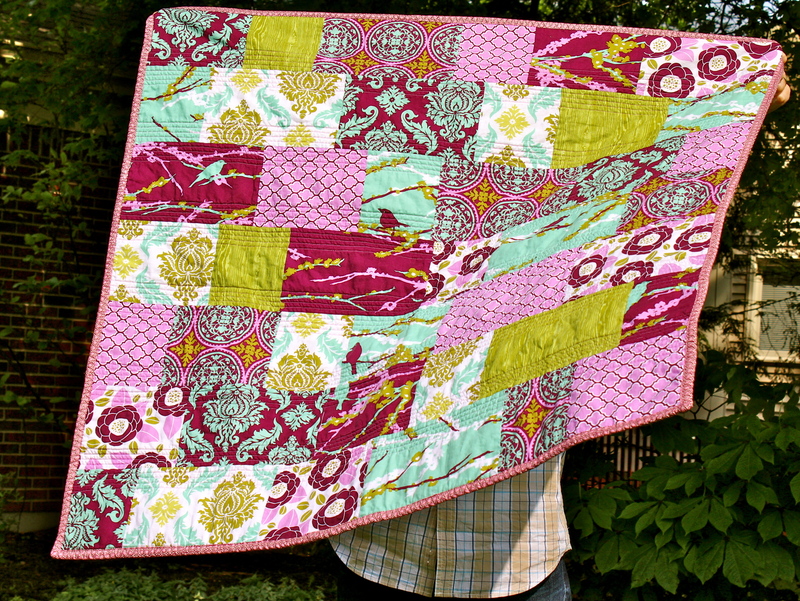 I loved working with the fabric and the quilt top came together in no time. 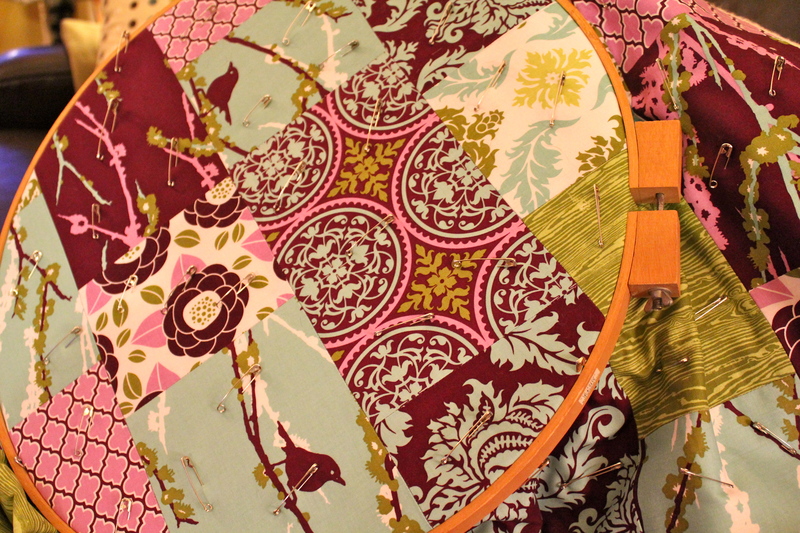 I LOVED using an asymmetrical pattern in the lay-out because 1) I like asymmetrical things and 2) NO SEAMS TO LINE UP! And yes - that sentiment DOES deserve all caps - especially from a quilter (like me) for whom precision does not come naturally. Once I pieced the top together, Randy and I made a trek up to The Fabric Shack in Waynesville, OH - kind of a fabric Mecca - to find backing and binding fabric. I didn't order any from the same line because I thought: "I'll get that stuff at JoAnn's - it will be cheaper than ordering and simple to match up." FAIL. I didn't realize how difficult it is to match up shades of purple and how few aesthetically pleasing purple fabrics there are to be had. Hence the trip to The Fabric Shack - where we did find suitable options - but even there they were few and far between. After I had the quilt front, batting, and backing sandwiched together and safety-pin basted I was feeling so in the zone that I thought it would be a great idea to try out hand quilting it. You know, for the experience. I'd sit on the couch next to Randy and watch my favorite shows and feel so connected to the quilt. 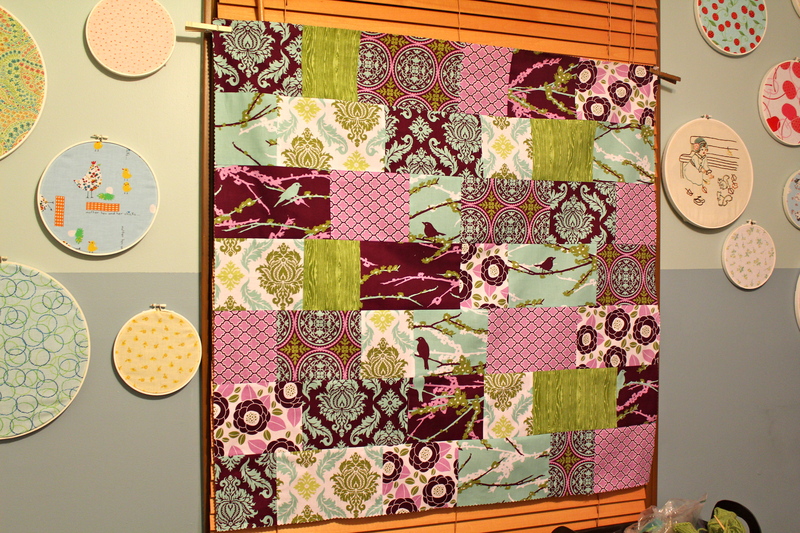 This lasted for about 20 minutes until I realized that my hand quilting looks like it was done by a blind 6-year-old. 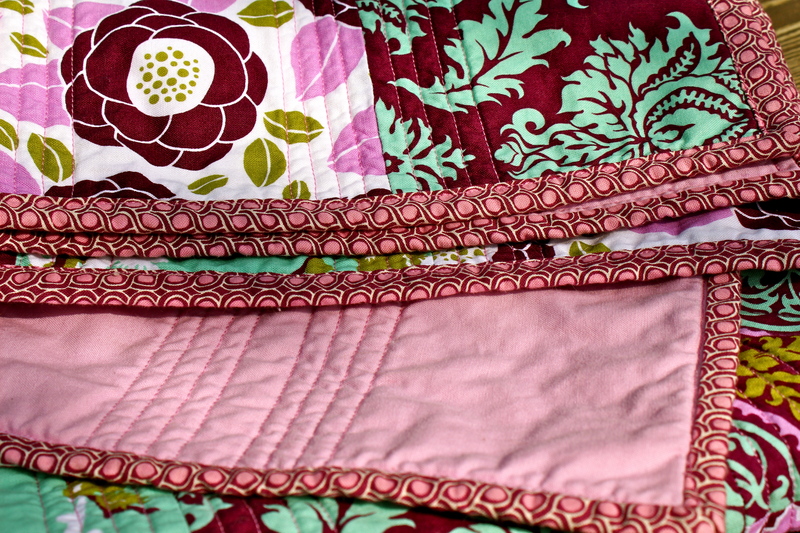 I'll need a lot more practice before rolling out any hand quilted beauties. 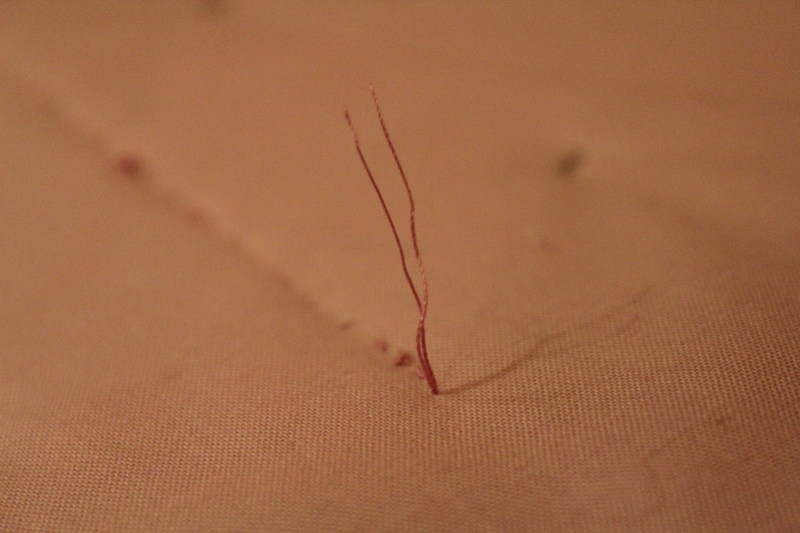 So out came the seam ripper and we went back to our regularly scheduled machine-stitched programming. Since the piecing on this quilt is so asymmetrical it didn't make sense to quilt along the all the seams, so I decided to stitch series of horizontal lines about 1/2 inch apart. I really like the effect and the added smoothness that comes from having no intersecting lines. 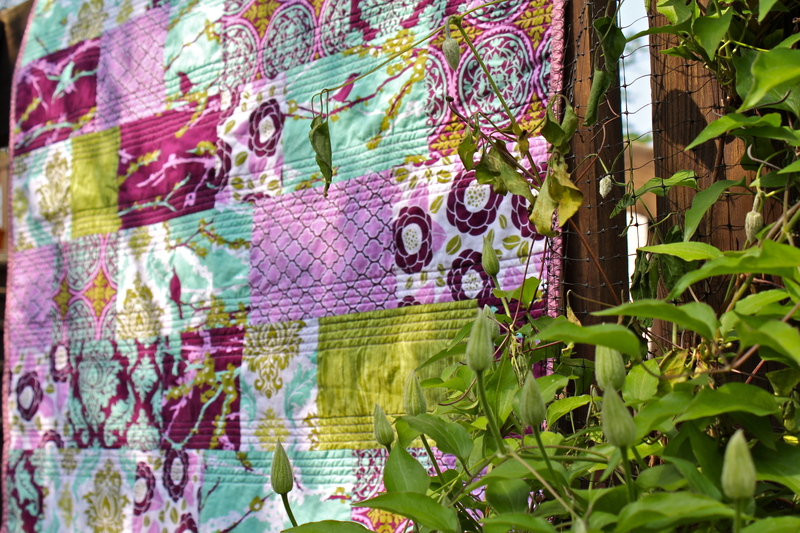 And so, with no further ado...presenting the Window Pane Aviary Quilt! And NO Kara from My Other Car is A Crane - this is not for you! Stop asking! 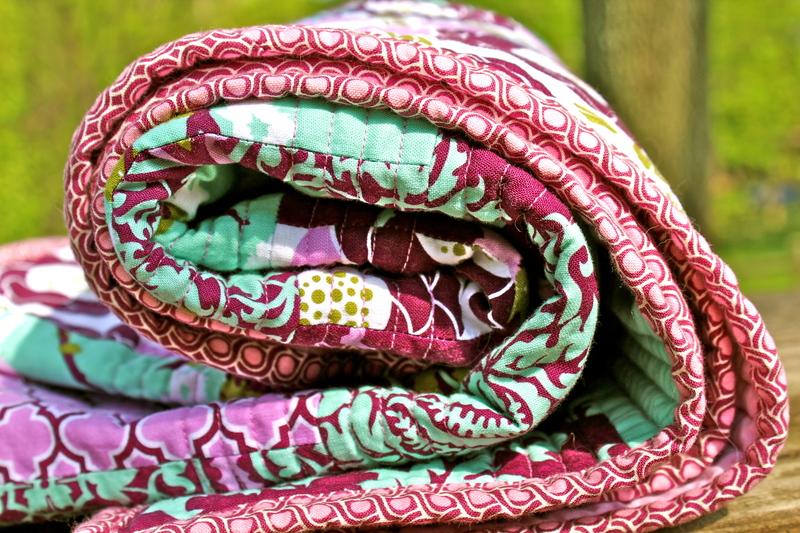 I can't wait to start working on the next quilt! Anyone interested? I love the fabric!!!! Great job Kim and how much does that one cost??? LOVE IT!! Amazing job, Kim! I am so glad I saw it in person...absolutely perfect. The pictures are great but don't do it justice. I'm going to have to find a need for a quilt soon! It just doesn't seem fair, I tell ya. PS- Your quilt grew a plaid shirt. Um...that is GORGROUS! Just beautiful. Will you email me or message me on FB? I have something on my pinterest site that needs to come and live with me. Wow. That's embarrassing. Learn how to spell. GORGEOUS. I don't even know what gorgrous means but it doesn't sound as pretty as gorgeous. Okay, I'm done now.